Continuing my experiments with piezos, which I began in Part 1 of this series, the first plan I had was to use piezos as contact microphones. This would enable me to amplify small string and percussion instruments, and, with additional circuitry, create new ambient electronic instruments. The first step would be to wire the elements to cables and jacks. It’s best I had read, to use shielded wire to do this, especially where the cables are long, so I thought it would be easier to buy and reuse cables with jacks already attached. 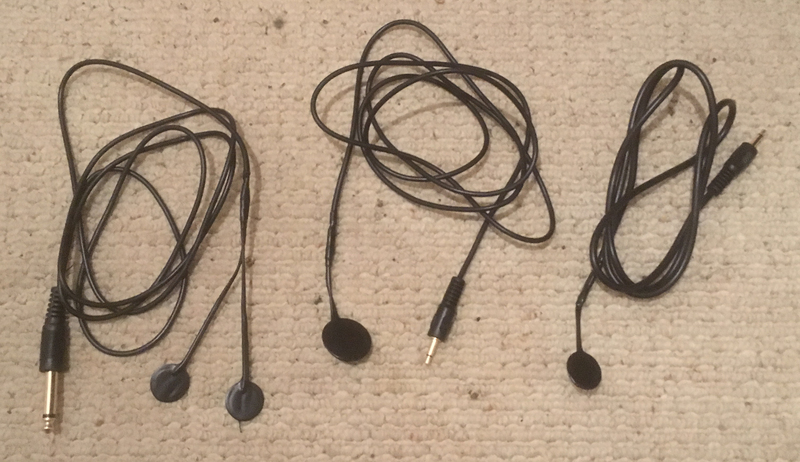 These are generally only about £1.50 – £2.00, so I bought some 2m leads with mono 3.5mm and 6.35mm jacks, and cut them in half. 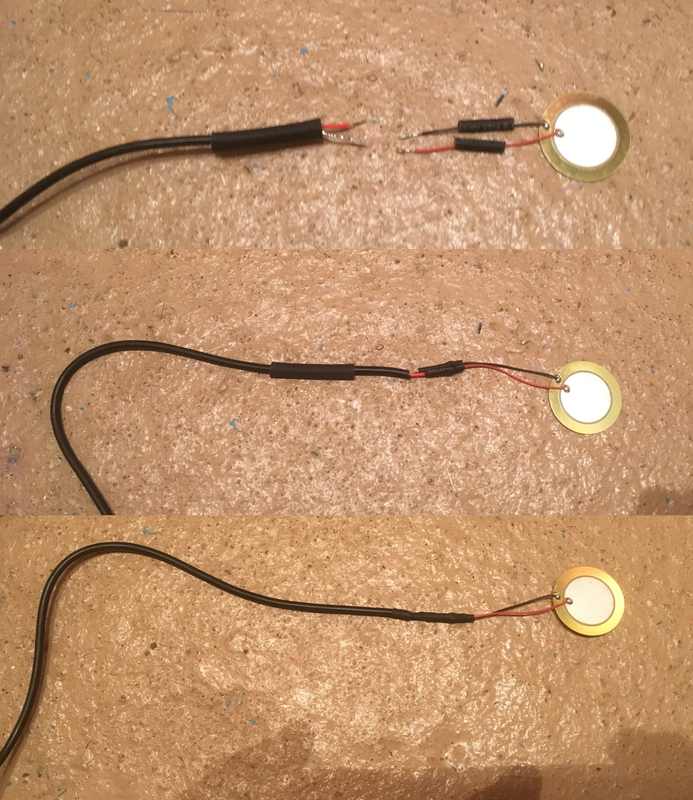 I soldered the stranded shield to the outside of the disc and the core to the centre, using lengths of different diameter shrink tubing to strengthen the connections and make sure the cut wires were kept apart. The already-attached leads were colour-coded black and red to indicate their function. At this point I tested the discs to make sure they were picking up sounds before moving on to the next stage. 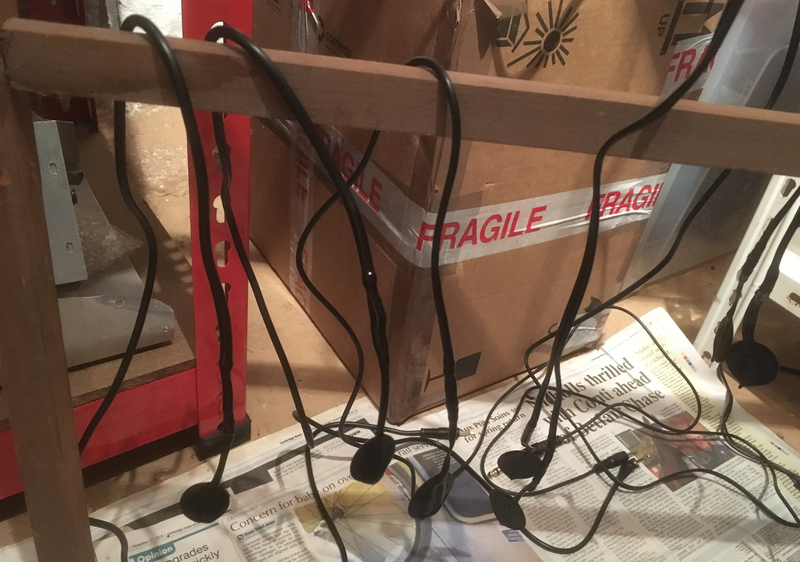 The next thing I did – again, a procedure suggested by Nic Collins – was to seal and further strengthen the piezo discs with rubberized paint. There don’t seem to be many of these on the market these days, and although – compared to the other components in these projects – it was rather expensive (having had to be imported from the US), I opted for the one Nic Collins used: Plasti-Dip. There is a cheaper Ronseal product, which is advertised as a liquid rubber for sealing flat roofs, but I wasn’t sure if it would be the right consistency. Ronseal has a very annoying website which doesn’t allow you to search for products by name, and I couldn’t find it there, but it’s called Isoflex , and you can get more details by searching suppliers’ websites. 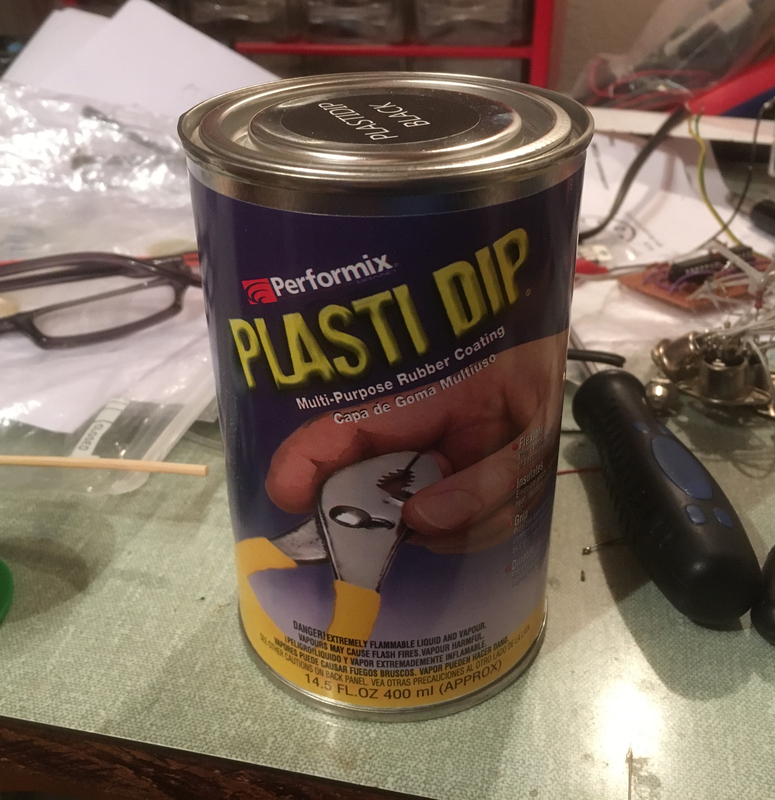 The Plasti-Dip looked rather thick, but the piezo discs are very thin and it wasn’t at all difficult to dip the ends in and cover them to a level just above the shrink tubing – the tin, as can be seen in the picture, is tall and thin, presumably for this reason. The Plasti-Dip did the job perfectly, and I’ll be looking for other uses for it in projects and around the house, as hardly any of it was used up! I bought the 400ml tin, as, at around £18 it seemed better value than the small tin at about £14 for 250ml, but even 250 ml would be a lifetime’s supply at the present rate. By the way, although there are many colours available, I chose black because of its lack of visibility, in case the microphones would be used in situations where they needed to be discreet – e.g. in the presence of wildlife. This would potentially be important in one particular future project. Nic Collins recommends putting a small piece of insulating tape over the solder connections on the backs of the discs to give them extra protection against breaking off – which would be a great shame after all the soldering and dipping – but I forgot to do this, so I hope the dipping is enough to keep them together. After two dips they looked fine. 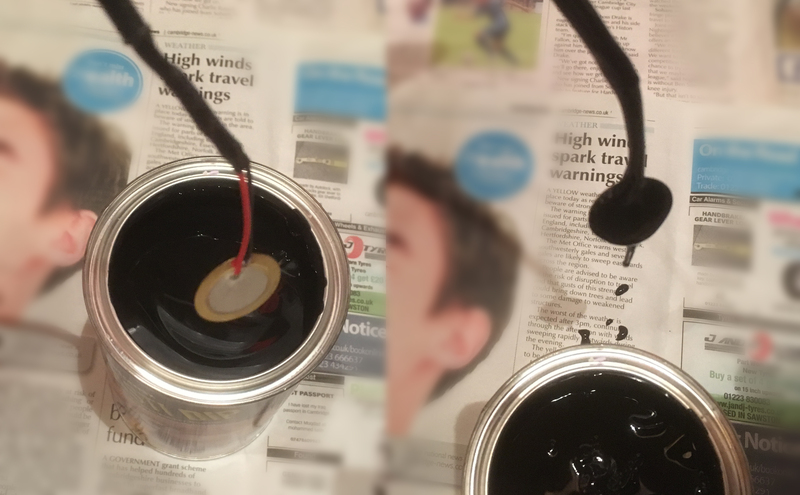 I was worried that too much paint would dull the sound too much: although there would be a number of applications where I would use the piezos without dipping – or with a single dip – Nic Collins certainly mentions two dips and says that three would cause dampening of the sound pickup. I was thinking that these ‘stand alone’ piezos might be used in a context where they needed to be waterproof, and one dip didn’t seem to seal them enough, so I left it there. The following picture shows two sizes of piezo mic, 18mm diameter on the right, 27mm in the centre. The one on the left has two elements connected in parallel. I thought this might be useful to record oddly-shaped objects or objects with a large surface area. I had read in more than one place that, although piezos can be used as contact mics just by plugging them into an amplifier or recorder, they work much better if the signal is run though a buffer circuit first. The buffer needn’t necessarily amplify, but the low-frequency response would in any case be significantly improved. Features of the circuit: the two diodes protect the opamp inputs from damage by restricting the maximum voltage that they can receive from the piezos. The TL072, which I used – or the lower noise pin-for-pin replacement, the NE 5532 – is a dual opamp, so two of these circuits can be built using the same chip. (The TL074 is a quad version, from which four circuits can be made). The pin numbers in brackets are those used by the second circuit built around the TL072: the second circuit is identical, and the only place where the two circuits meet is at the point marked A, the half supply voltage point created by the voltage divider – these two 100k resistors don’t need to be repeated for the second circuit. 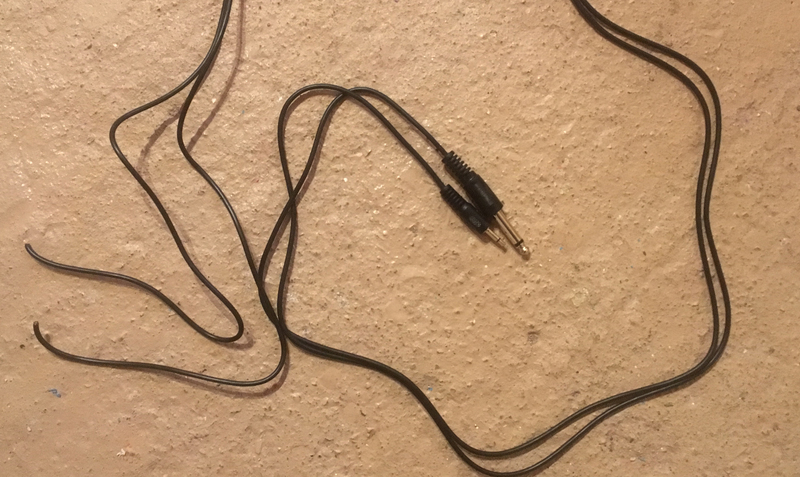 So I decided to stick with the opamps – the most recent batch of TL072’s I bought were between 4p and 5p each; the NE5532’s were more expensive at about 20p. 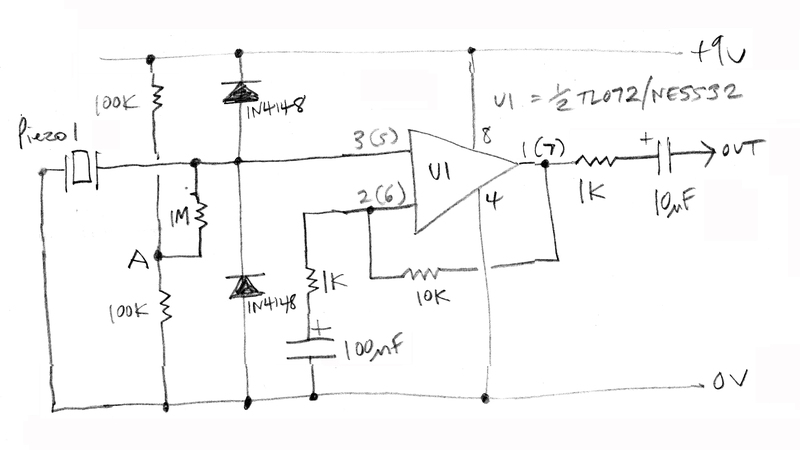 So, as soon as the microphone assemblies were ready, I made up one of these circuits with a TL072 and tested it out. I plugged it into the line input of my MacBook, and it seemed to produce little background noise. I attached two of the piezos which I had prepared as above, and clipped them to a plate, recording the sound in the Audacity app as I tapped the plate with a pen. As a comparison, I turned off the buffer and plugged the piezos directly into the computer. The following short sound file illustrates the difference the buffer makes. The output was a little louder with the buffer than without so I adjusted the recordings to be more or less the same volume. First heard are the taps with the piezos plugged directly into the computer; then the taps using the buffer. The difference is quite striking. The buffer does amplify the sound, but I’ve tried to minimise this in the recording: nevertheless, there is a noticeable increase in the lower frequency response when the buffer is used. The sound is much fuller, so, although the small expense and time involved in making buffers does add to the cost and the effort of piezo projects, I think it’s probably worthwhile for the improvement in the quality of the results. This seemed equally effective, but with a lower component count]. 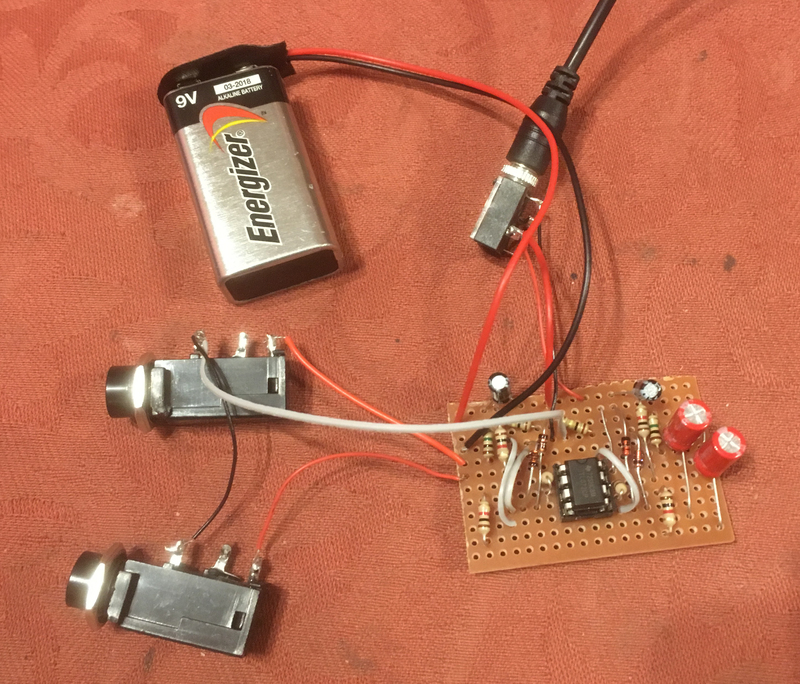 In Part 3 of this series I’ll describe some particular projects in which I used the piezo elements as microphones, mostly with the buffers. Hi Andy. Sorry i ask you here and not in a stylophone beatbox topic you made in the past. Can you tell me please how much in Ohm a stylophone beatbox have (i don’t own the manual) and if i can use a weak speaker of about 4 ohm inserted in the stylophone headphone plug ? The speaker inside is 8 ohms, but the headphone socket is probably made for modern PC/mp3 player stereo headphones. These are not usually more than 32 Ohms, I don’t think. I shouldn’t imagine it would damage the beatbox to use a 4 ohm speaker, but I don’t know if it would sound good. Thanks. I used a low toy type chinese speaker and it sounded weaker.